1 Gently heat half the oil in a large frying pan. Add the Knorr Beef Stock Pot and cook very gently for 2-3 minutes, stirring regularly, until the stock melts. Tip the mixture into a bowl and leave to cool for 2-3 minutes. 2 Brush the stock mixture all over the steaks then place the steaks into a hot frying pan. Cook for 2 minutes on each side, then turn the heat to low and cook for further 1 minute on each side, or longer depending on how you like your steaks cooked. Remove steaks from the pan and leave to rest in a warm place. 3 Meanwhile, heat the remaining oil in a separate large frying pan. Add the mushrooms and shallots and cook on medium heat for 4-5 minutes, stirring often. Add the garlic and thyme, cook for 1 minute then add the wine. Bring to the boil, simmer for 2 minutes stirring well, then add the Balsamic glaze. 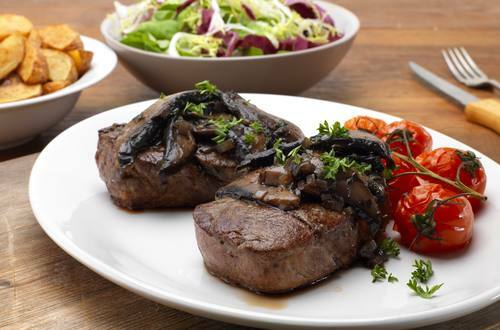 4 Serve the steaks with the glaze and mushrooms and garnish with fresh thyme. Sprinkle with chopped parsley if desired.